Tonight on Locals Only we have Chamberlab live in Studio 2a at 9pm. ChamberLab is a quarterly concert series devoted to bringing art music from unlikely sources into unexpected places. It’s garage classical. 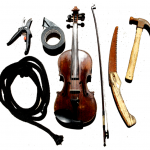 It’s DIY Chamber Music! Composers include Chris Black, Dante Rosano, Marco Rosano and Benjamin Degain; writing for bassoon, violin, piano, contrabassoon, contrabass, Wurlitzer, bari sax, vibraphone … and more. Chamberlab performs Saturday May 19th at Club Congress, 8pm. For more information, please visit www.chrisblackmusic.com.